Snakes slither, horses trot, birds fly, but how do plants move? 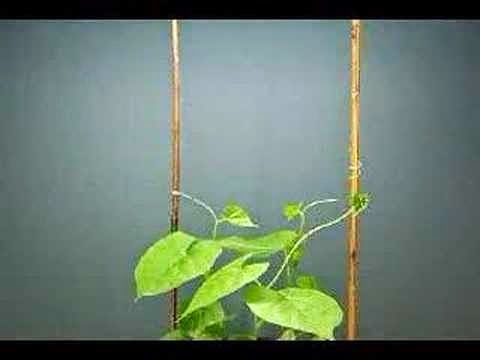 Check out this clip and see how vines grow. This video is much faster than what we could see in real life. If you could stand next to some bean plants and be very still for a couple of weeks, the plant might attach itself to you! Did you notice in the clip how the vines circled around reaching out for something to catch? The two poles on either side of the plants are there to guide it and help it to grow in the right direction. When babies are very little they reach their hands out to parents. They need help and parents are there to give them help. Even big kids need parents to help them get food and clothes, to help them with homework, to teach them right from wrong, and to show them how to praise God. See how this father helps his child to walk? God gave you parents to guide and help you. Your parents are like bean poles guiding you in the right direction. In this verse Jesus tells us He is the vine and we are the branches. When we are attached to the vine we are fed by God’s word and we grow and learn and do God’s work. God gives your father the job of teaching you God’s word and guiding you in your life. Wrap your arms around your father, or grandfather, or any parent who loves you! Remember, God loves you, too!